Joyelle Nicole Johnson brings joy to the stage. Honored to be a reliable opener, her comedic dream came true when she was asked by her idol, Dave Chappelle, to open for him in Little Rock and Atlanta. She regularly features for Hannibal Buress and has opened for other legends like Russell Peters and Maria Bamford. 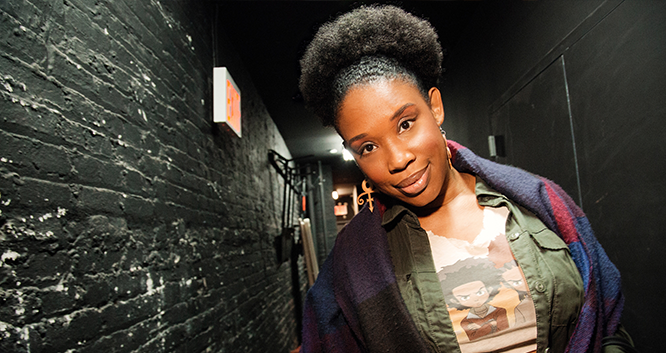 Joyelle made her network TV debut on Late Night with Seth Meyers and most recently she wrote for Broad City. She has performed on Wyatt Cenac’s Night Train for SeeSo as well as LaffMob for TruTV, was a panelist on Refinery 29/Facebook Watch’s After After Party and can be seen in the upcoming season of HBO’s Crashing and Comedy Central’s digital series Comics to Watch. She was selected for the 2018 FOX Comedy showcase, was a finalist in NBC’s Stand Up For Diversity Showcase and has performed at festivals like Sketchfest, Bonnaroo and Bumbershoot. She also tours with Daily Show creator Lizz Winstead’s Lady Parts Justice League making her dreams of combining comedy and activism come true.